The photo above was taken last year when we were in Oregon. Oregon has one of the most beautiful coastlines I have ever seen. And I've seen quite a few, being a lover of the sea. A day to reflect on what brings me joy and comfort. And that, to me, is the sea. The smell, the wind, the life it holds. Now that's what I call a real 'present'! My wish today? That Irene is kind to our coastal friends. Stay safe ... and high ... and dry! WOW - that photo is spectacular. Happy Birthday! I hope you have a fabulous day. Thanks you for sharing your beautiful photos and words with us. It's always a treat. Happy Birthday! I understand your connection to the sea. We, too, have strong ties to the beauty, power, and grace of the sea. Oh I know,,,, I think we are all a bit concerned about all who live on the coast. They must be worried sick. Happy birthday! And wow - that is a breath-taking photo! You are a true artist, my friend! Your photo is stunning and your poem, how wonderful. It is really so evocative. I especially love the part about the evidence of yesterday being washed away, wow! I never would have thought this is the Oregon coast! Your posts are so good that admittance should be charged! HAPPY, HAPPY BIRTHDAY!!!! Happy Birthday . Love your image and words. They sure filled me . Happy Birthday, new blogging friend! What do you do to your photos like the one at the top? Beautiful! Ahhhhhhhhhhhhh, HAPPY BIRTHDAY reena!!! You don't hear about many women sailing our oceans. Great for you! Nice to see a woman at the helm. Have a wonderful day. Cheers!! Happy Birthday....as an Oregonian (but clear on the opposite side from the beach! ), I'm curious as to the location of the photograph. Beautiful image and beautiful words again, Reena. Happy Birthday! Happy Happy Birthday!! And - what a beautiful coastal image. I've never seen the Oregon coast..but have heard it's beautiful. May your day be everything you wish for!!! Wishing you to keep on finding new dreams to follow! oh my dear, what a lovely photo. it's splendid! I'm wishing you a very happy birthday Reena. and many more. I hope you have a wonderful time with The Professor! happy day to you. Beautiful poem. Thanks for sharing it and I hope you have a great weekend. We are hoping to be far enough west of the brunt of Irene...we'll see. What a lovely poem and spectacular image to go with. You share one of my nieces birthdays! Have a wonderful one with the Prof. pampering you throughout the day! Happy birthday, Reena! I very much like the magic of this photo. It's perfect for celebrating your birthday. That Oregon coastline photo is unreal! Enjoy your 59th lap around the sun and I hope for everyone on the right coast, you get your wish. Happy Birthday! Enjoy every moment. Right in you knows whose path in southern coast MA! And happy birthday also from Italy, dear Reena! My thoughts to all the American people waiting for Irene, sincerely hope that she'll be kind enough with them. HAPPY BIRTHDAY, Reena!!! Hope you and the Prof have a wonderful day. I truly hope that Irene wimps out very soon. Stay safe. A very Happy Birthday, Reena! Hope you celebrate the entire weekend, but do stay safe!! Your coastline shot is gorgeous and I agree with you, Oregon does have one of the most beautiful coastlines I've ever seen. I lived in Portland for 15 years and went to the coast at every opportunity! Never tired of it and never found it to be exactly the same, but always beautiful! Take care! Enjoy! A nice Image that I see. 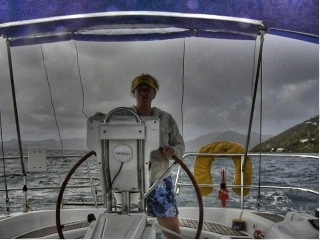 You at the Helm of a boat or sailing ship? I must admit that I have mixed emotions about loving the Sea. Being in the US Navy aboard a Destroyer and sailed all over the Pacific, I have seen just how nasty the Sea can be. However, I have also seen just how beautiful the sea can be. I do have a appreciation for it, but I always have a great respect for the Sea and what "she" can be. Happy day! I hope Irene doesn't do as much damage as they are predicting. Stay safe. Happy, happy Birthday! I hope that The Professor gives you the best day ever. I understand and appreciate your connection to the sea. Mine is to water of all kind. With one of the Great Lakes practically at my doorstep, and the Finger Lakes not that far away, I have learned, in my life, to love all of their many aspects. Here's hoping that Irene is a big dud. Today was such a beautiful day that it is hard to believe a storm is coming...we have prepared as much as we can and will now just be waiting it out....Stay safe! Happy Birthday. What a lovely photo. The Oregon Coast is my absolute favorite. Wishing you the happiest of birthdays! What delightful colors in that photo of the coast. happy birthday girlfriend!! that picture really made me go WOW!!! i hope the weathermen are wrong, they usually are!!!! Happy Birthday Reena...I hope your day was all that you wanted it to be. Happy Birthday Reena! Gorgeous shot, I'd love to see the west coast some day. That is a beautiful photo. I agree with you, the Oregon coast is by far the most beautiful of any coast I have seen too. We lived on the southern end of it for awhile. a very happy birthday to you and what a place to reflect from, I love this shot. So sorry I'm a day late but...HAPPY Birthday! I hope you had a wonderful day and that the Professor spoils you all weekend long. Fantastic photo. Love your poem! Happy Belated Birthday. I hope you had a great one!! Did you write that poem? So beautiful!! The picture too! Love your photo - and the poem. They're both beautiful. Hope the storm fizzles out before it gets to you. The outer bands are reaching us now. reena . the words so rhythmic like the surf ..this post just touched my heart ..wishes for you to have a special year ahead ..happy birthday!! Happy Birthday lovely sea girl! happy birthday, enjoy it. my wish is the same as yours for the people in the path of Irene. i love the photo, beautiful spot and shot. A wonderful post and a very beautiful picture. Well done. Congratulations with yesterday and a nice weekend to you. Very happy belated birthday wishes, dear Reena; I wish you many happy returns of the day and all, or many of them, in the place you love best. Happy Belated! Hope it was grand. The photo and poem, just beautiful. Happy belated birthday wishes my dear friend. Ohhh Van Harte Gefeliciteerd!!! and yes this means Happy Birthday in Dutch!!!! may there be many many more happy years to come! Happy birthday to you, and i hope everyone on here will be safe during Irene's visit past the northeast. Richard from the Amish community of Lebanon,Pa. This photograph is gorgeous. Oregon's coastline is truly amazing, and you have captured it so beautifully. I hope Irene passes through quickly and without incident for you. Happy Birthday, your image is awesome. Well done!! Well darn! I'm a day late wishing you a Happy Birthday!!! Hope it was one to remember! Hoping You Had the HAPPIEST Birthday ever!!! PS: I hope you're having a good weekend!! 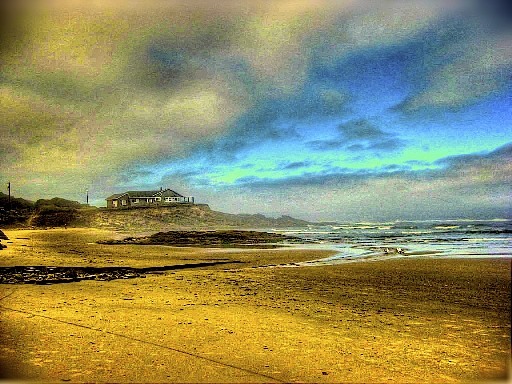 I LOVE the picture, and you're right about the Oregon coast--It's just amazing!! Happy Happy Birthday to you Reena. I hope your day was spectacular!! I'm a tad late to the party again. It is Irene's fault. LOL Our power has been dipping on and off today. Irene is one slow moving huge storm...she will not leave. We've only had rain and lots of wind but it just will not let up. I hope she loses some steam before she reaches you all. For a Cat 1 she has been a real pain! Happy Day to you. I know it will be special. I also love the sea . It makes everything better. Happy B-day, Reena! The photo reminds me of Yachats, OR - we drove the coast this spring. So lovely. Don't get blown away. Stay safe and dry. Happy, happy birthday, a couple of days late, Reena! I hope your day of wishes was soul-satisfying. I do love the Oregon coast too. So beautiful...hope you all are okay this morning. Connecticut is still here! happy birthday! hope you stayed dry. not so bad where i am in manhattan, but still not over yet. Happy birthday! I like how you processed that photo, beautiful. I do hope dear Irene has not caused too much disruption round your way. the sweetest adventures so far! Oh Happy Birthday, I think I may be late in wishing you that, busy lately, our son was home introducing his new fiance to the family!! Lovely, lovely image!! Happy belated birthday! I feel the same way about a beach. I've never been to the Oregon coast, but I feel it calling me - I've seen several mentions of it in just the past few weeks! Gorgeous photo! Hope you've had a wonderful weekend!! I'm always a day late and a dollar short as the saying goes. Sorry I didn't get a chance to throw out some birthday wishes on your special day. Irene prep took over our life. I hope you had a great birthday and enjoyed the "salt life" somewhere. A belated happy birthday to you, dear Reena! I hope it was a wonderful day and wishing you many, many more. Just gorgeous photo! Happy birthday and here's to another good year.